If flexibility is at the top of the agenda in your search for stainless steel wire rope, our 7×19 construction range will be one of the best options to select. This 2mm 7×19 Stainless Steel Wire Rope example is the narrowest rope available in this construction and offers lots of benefits to buyers. A 7×19 construction rope is made up of seven bundles of wires, each of which contains 19 stainless steel strands. 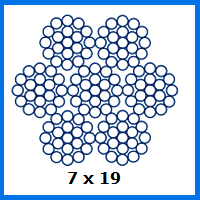 There are six arrayed around the outside and one more in the middle, allowing for an impressive level of malleability not found on equivalent 7×7 or 1×19 rope. Since the strands are made of stainless steel, the corrosion which might normally occur on lesser metals will be entirely absent. This not only keeps the rope looking its best for as long as possible, but also means that it will not need to be replaced nearly as soon, even if it is used outdoors or in marine environments. Since we construct wire rope in-house, as well as supplying various fittings, we can make you a bespoke assembly using 7×19 rope. Simply let us know what you want to use the rope for and our experts will come up with the perfect product in a jiffy. You can call 01384 78004 to get guidance and quotes from the Rope Services Direct team. It is also possible to email us from our website when you have a question. 2mm 7x19 Stainless Steel Wire Rope Overall rating: 5 out of 5 based on 6 reviews.